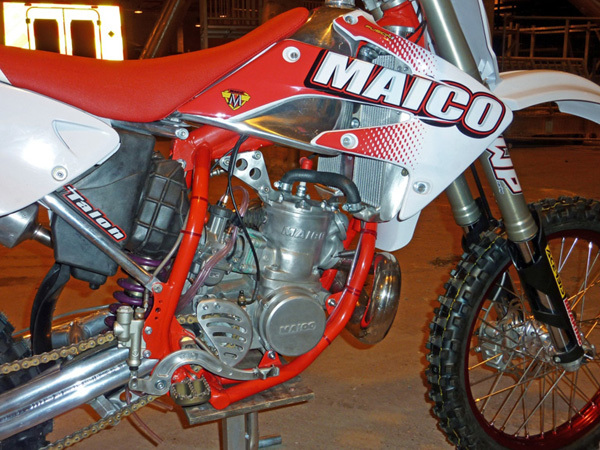 Following a recent emergency operation on a twisted muscle, Maico Internationals Dunlop Maxima rider Neil Berry is gearing up for the season ahead on the new 320 M.M.X. Co-ordinating the ongoing development program, Berry will be faced with the task of testing and evaluating all the new products for the bikes which will be making their way onto the options list and ultimately standard equipment for 2011.With an extensive range of products already under manufacture here in the U.K. the likely candidates to make it to the bike first are all new silicone rad hoses being made exclusively for Maico International and a new ally kick start designed by ally tank guru Simon Parker, which will be available in two different lengths to suit riders of differing heights. Unlike many other manufacturers who shy away from the public gaze whilst testing new bikes and products under a cloak of secrecy Maico International are keen to promote the public opinion which will inevitably be voiced throughout the year and encourage constructive comments and ideas from riders who could provide valuable input into new products.